First, let me say that I've read tons of books in my life but the Bible is by far the most interesting, fascinating, prophetic, encouraging, enlightening and inspirational book I've ever read. I would say that whether I was a believer or not, but because I do believe every word, it is much more than a book to me. It is the Word of God that answers mankind's ageless questions as to why we are here, how did we get here, where are we going, what is the purpose of life, and how do we find eternal life. But, let's face it, the Bible leaves out a lot of details we writers would love to know! Things like facial expressions, internal thoughts and dialogue, feelings, and sometimes just a general description of the setting. If you're like me, you're dying to know more, see more, get a deeper insight into the way things happened. Biblical Fiction attempts this and does pretty well I hear though I haven't had the privilege of reading any. 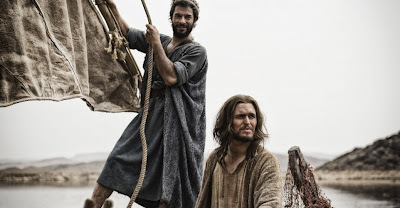 But to see the Bible played out in a movie setting is pure heaven to me! I've often asked God if He has a 3-D, Digital movie of the actual events, because when I get to heaven I will be first in line with my popcorn to watch it! That's why I was really excited to see this new series. I saw the producers interviewed on TV and they seemed to be decent, Godly people, which only encouraged me further. Maybe finally we would have a production that didn't twist the stories and that gave glory to God. And I must say I have truly enjoyed every moment! What a treat to watch all the characters I've read so much about! To see their expressions, hear their voices, enjoy the incredible settings. Miracles such as the burning bush, the parting of the Red Sea, and the plagues of Egypt were done exceptionally well. I've currently only watched the first three installments so I'm waiting anxiously to see how they show Jesus's miracles in the New Testament. Best of all, the ratings for the show have been beyond expectation. People are interested. They are picking up their Bibles. They are talking about God. Isn't that the point? What saddens me is that so many Christians are going around bickering and complaining about certain things they didn't like about the series. They didn't like the way Abraham was portrayed. They didn't like Moses. They thought the producers took too much license here...added too much there. The don't like the way angels are portrayed. They don't like the way some things don't follow the Scripture exactly. And on and on and on.... And I have to wonder to myself, what a terrible witness to the world! Yes, creative license was taken in some stories. It had to be taken because the Bible leaves out so much between the lines. Yes. some scenes didn't follow the Bible exactly. Yes. Abraham didn't appear to be have as much faith as the Bible claims. Yes, they are going fast and skipping stories. Yes, some parts are bloody. But my question is: Is the theme of the story still coming through? And is God being glorified.? I would have say an emphatic yes to that! I sincerely wish they'd done 20 hours of the Bible, not just 10. There are some cool stories I would have loved to see included like Joseph and Ruth and Esther and Elijah. But hey, they only had 10 hours! I love that they've dressed up the angels in armor and made them look like warriors!! That's how they are! 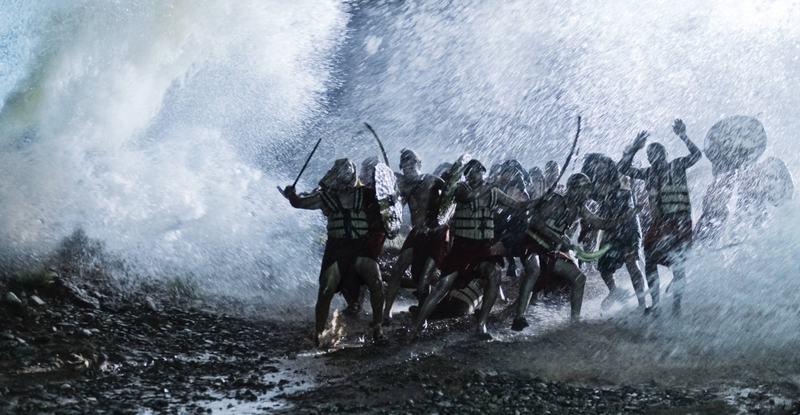 I loved the parting of the Red Sea and how Huge God showed up. And my favorite so far was when Jesus is in the boat with Peter and they've hauled in more fish than the boat can hold and Peter asks him something like "What are we going to do?" And Jesus replies "We are going to change the world." I can't wait to see the final two episodes. If you haven't had a chance to watch it, please do. It's not perfect. It won't meet all your expectations. Some parts may disappoint you, but God is being glorified and Jesus is being preached! That's all that matters! I hadn't realized that "The Bible" series, was only a 10-hour program, which would explain why some stories, etc, have had to be ommitted -- for the sake of time. Not having seen it right from the very beginning, and only parts of it ... I've found the visuals/dramatizations very interesting for sure. Even on secular television stations, this series has made a HUGE hit, and, been extremely well received. And, I thank-you, for getting the final message home to me -- that God is being glorified, and Jesus is being preached ... and that truly, is what matters ! Well said! There's definitely been some creative license used, but God's word is on TV!! The Bible is on TV!! In this day and age where our world is rapidly slipping down into depths we couldn't have believed would happen, The Bible is gathering fans. If this gets folks to think about God, to open a Bible to see if that exciting adventure is really in there, if one person turns their life toward Jesus, then every little "error" is worth it. God uses our mistakes, which is pretty much the point. Well, I guess I would be one those complainers you don’t like! I don’t care about some of the things that people have been nit picking, like how Samson was black, or Noah sounded Irish. Those things really do not matter to me. I am just saddened at how much they are butchering Scripture! The whole Bible is about Jesus, even the Old Testament. And my biggest issue with the first couple episodes was at how everything was so man centered. Yes, God choose people and He worked through man, but it was still Him doing the work. They took out some clear opportunities within the parts they showed in OT to foreshadow the coming of Christ. What a missed opportunity! There are so many denominations, they would never be able to please everyone. I guess I just expected, a clear miniseries that would boldly proclaim Christ from beginning to end. I did not expect them to put everything in, they would never have time for that in only 10 hours! What I did expect, is that they would stay true to the text, not add stuff that was not in the Bible and take out stuff that was. If you have to add stuff, then add the stuff that we have record of in the Bible! I actually cringed when he said, “We are going to change the world.” Where was that in the Bible? Certainly, Christ changed the world, but there was no we in it. It has nothing to did with me, you, us, only Christ. He made a way for our sins to be forgiven, and that changed the world. He reconciled God and man! It was such a great opportunity to really preach the Gospel, and get back to what it is all about, which is Christ, and I feel that really messed it up. I am nervous about this week. I fear it is not going to be about Christ coming to save sinners, it is going to be about Christ coming to make people’s lives better here and now, with a lot of social gospel thrown in. But, I hold off my judgment until I watch it! I totally agree with your comments. I've been watching each Sunday night and it's exciting to see the stories come 'alive'. Yes, some of the stories are not word for word as written in the Bible, but again His message is getting out there and people are hopefully reading His Word and the stories for themselves. I ABSOLUTELY love the way the angels are portrayed as Soldiers of God. It's such a refreshing change from the usual white robes and halos. Many times in the Bible they are listed as being in battle with evil forces, so to me seeing them in this context is fitting. Mark Burnett and Roma Downey (Producers of "The Bible") came to my work to promote this series and gave us some behind the scenes information. It was fascinating to hear how God moved during the filming and the way they covered it with prayers. They wanted this to be an evangelistic tool to show God's love and put a desire in people to read the Bible. I'm sure everyone has opinion about what could have been done differently, but the bottom line is that people hear the message and long to know more. But, I do agree that I like the portrayal of warrior angels and such :) I would say that the series has both valuable points (spreading the word about Jesus is certainly a plus and I'm excited about that!) but the drawbacks are troubling (for me at least) just the same. Wow, not sure what to think. I haven't seen this...I have no cable...so I can't say anything about it. 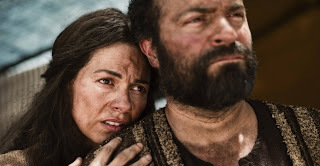 I can tell you that I have never watched real actors portraying Christ, just the way I roll...anyway, after reading these comments, it seems to me that this mini-series has a lot to offer, yet has some drawbacks. The Rahab story, for instance, bothers me. I, too, love that story and to portray her as being 'forced' to hide them seems wrong to me. But, like I said, I haven't watched it. I pray that many people are brought to Christ through this production and that even Christians are brought closer to God through it and not drawn away from Him. Love you, MaryLu and your honesty! They way they handled Rahab was a great example of one reason I am not liking this series! They are taking amazing parts of the Bible and changing it. We don’t know a lot about Rahab, but what we do know, they did not present well. Another one that bugged me was the story of Samson. According to the miniseries, Samson rebelled against God and married a Philistine. My Bible says that Samson’s marriage to the Philistine was of God. And how they made it seem like the Philistines burned his wife and father-in-law because the Philistine’s did not want to mix with the Israelites. That is not why the Philistine’s killed his wife and father-in-law. We have the clear text in, so I don’t see why they change things like that. Unfortunately we were without TV for some of this series, and so, have not seen all of it. However, I will say we have thoroughly enjoyed what we have been able to see. Does anyone know if it will be available in DVD format? I sure hope so! Thank you, Mary Lu, for solidifying what I have been feeling as well toward the series! A friend of mine has been up in arms about the series, based on the opinion and misconceptions of a blogger who claims that The Bible has changed a lot of things from scripture and that it really exalts man over God. Having watched the first several episodes at the time, I haven't sees this to be at all true! It showed mankind for the flawed, sinful people we are, and all the greater in need of a Savior! When I studied the points on the blog, a lot of them were either things that had been misunderstood, taken out of context, or things that were, as you said, left to the imagination.